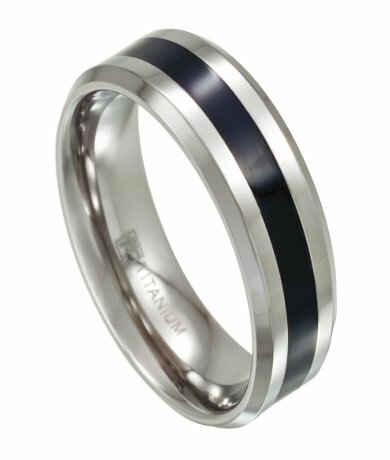 Sleekly sophisticated, this two tone titanium wedding ring for men is versatile and modern. Polished titanium contrasts handsomely against a black resin center inlay. Beveled edges and an 8mm comfort fit band complete this contemporary wedding band.Comfort-fit rings should be ordered 1/2 size smaller! A great quality ring for the money! Buyers please note, in the picture the ring looks more satin, but as stated the ring is polished. I've only had the ring for a short time so I can't comment on how it holds up long term, I'm expecting it might get a few nicks and scratches, time will tell I guess. 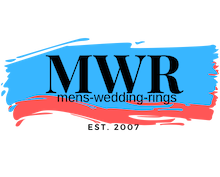 Thank you all @ M.W.R for your great rings and service! This ring is perfect. High quality without the high price. I also want to commend MWR for their outstanding customer service. Never have I been so pleased dealing with a company who goes out of their way to make sure you are happy and satisfied with your order.